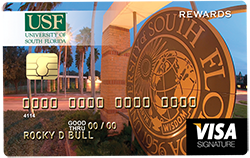 The official credit card of USF. Our Rewards Visa® offers a robust rewards program without sacrificing competitive rates or low fees. 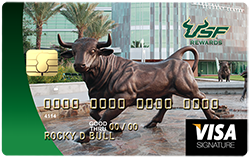 Plus, purchases provide support to the USF Alumni Association at no additional cost to cardholders. Earn a point for every dollar spent and redeem at curewards.com/usf for what matters most to you: cash back, airline flights, gift cards or premium merchandise. With Rewards for U (aka CURewards), your points add up quickly and are conveniently redeemed online. Register your account to track your points and redeem rewards at www.curewards.com/usf. 2. $3,000 of qualified spend in the first 90 days required to earn 10,000 bonus points. Points earned on net purchases. Returns, cash advances and balance transfer transactions do not earn points. *APR= Annual Percentage Rate. Credit cards are variable rate, rate may change after account opening. Subject to loan approval. Rate may vary upon individual credit qualifications.